THE owner of a machinery firm is looking to take the company to the next level with a new marketing strategy and growth in global markets. Craig Williams, managing director of Sagetech Machinery, which designs and manufactures innovative, reliable and safe vertical panel saws, has moved the business into a large unit estate at Chilton Industrial Estate, in County Durham, as he looks to grow the business and develop new products. 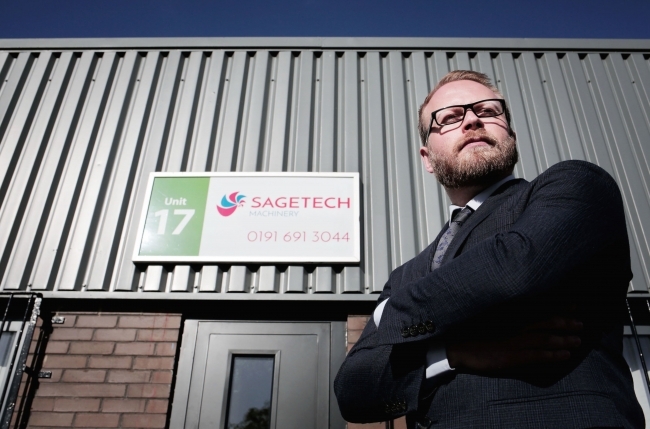 Craig bought Sagetech in October last year, having known the previous owners for a number of years, and started trading in January as Sagetech Machinery. Craig said: “I’ve seen first hand how the business has grown over the years and how the machines have been designed and developed. I’m now looking forward to taking our new company to the next level with a new marketing strategy, new innovative product range and international sellers. The company’s precision machines are manufactured in the UK, with design and some assembly-taking place at their new premises, which are run by Business Durham, the economic development organisation for County Durham, working on behalf of Durham County Council. The unit houses office facility, demonstration showroom, small production and warehousing. The company has just launched its new website, www.sagetechmachinery.co.uk along with announcing its new desktop engravers and 3D Printer range of machinery to complement its vertical panel saws. Since moving into Chilton, Craig has taken advantage of the support offered by Business Durham, including advice on joining the County Durham Engineering and Manufacturing Network (CDEMN) and on signing up for Durham Oktoberfest. “The support that Business Durham has provided to us has been incredible. With such growth in a small period of time their knowledge, support and network capabilities are helping us to achieve our goals,” he said.